Use handy membership and shoot record classification cards. Participate in the Crossfire program, which allows shooters to enter registered Sporting Clays tournaments without a separate NSCA membership. 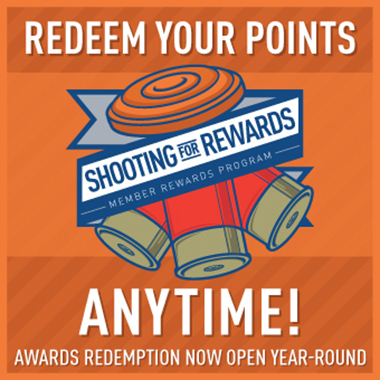 Earn points for every target shot and spend them on logo clothing, shoot certificates, shooting gear, and other useful items. Enjoy instant savings up to 85% OFF name-brand products and services from NSSA partners such as Hertz, Budget, Thrifty, BP, Office Max, Office Depot, Marriott, Harrah’s, Radisson, Wyndham, America’s Best Value Inn, Caesar’s Las Vegas and Atlantic City, Bally’s Atlantic City, Fed Ex Office and more. Get NSSA member-only discounted rates on gun floater insurance for individual members and liability insurance for clubs through Sportsman’s Insurance Agency, Inc.